^ Bard, Encyclopedia of the Archaeology of Ancient Egypt, p. 694. ^ National Geographic Society: Egypt's Nile Valley Supplement Map, produced by the Cartographic Division. ^ Montet, Géographie de l'Égypte ancienne,（Vol I）, p. 28-29. ^ Najovits, Simson R. Egypt, trunk of the tree: a modern survey of an ancient land（Vol. 1–2）, Algora Publishing, p171. ^ Montet, Géographie de l'Égypte ancienne,（Vol I）, p. 32. ^ Chandler, Tertius ( thertgreg1987). Four Thousand Years of Urban Growth. ^ Nefertem. The Walters Art Museum. ^ Manley, Bill (1997). The Penguin Historical Atlas of Ancient Egypt. Penguin Books. ^ Breasted, Ancient Records of Egypt, p. 109-110. ^ Goyon, Les ports des Pyramides et le Grand Canal de Memphis, p. 137-153. ^ Al-Hitta, Excavations at Memphis of Kom el-Fakhri, p. 50-51. ^ Mariette, Monuments divers Collected in Egypt and in Nubia, p. 9 and plate 34A. ^ Mariette, Monuments divers Collected in Egypt and in Nubia, § Temple of Ptah, excavations 1871, 1872 and 1875, p. 7 and plate 27A. ^ Brugsch, Collection of Egyptian monuments, Part I, p. 4 and Plate II. This statue is now on display at the Egyptian Museum in Berlin. ^ Herodotus, The Histories（Vol II）, § 101. ^ Diodorus Siculus, Bibliotheca historica,（Vol I）, Ch. 2, § 8. ^ Cabrol, Amenhotep III le magnifique, Part II, Ch. 1, p. 210-214. ^ Petrie, Memphis and Maydum III, p. 39. ^ Cabrol, Amenhotep III le magnifique, Part II, Ch. 1. ^ Mariette, Monuments divers collected in Egypt and in Nubia, p. 7 & 10, and plates 27（fig. E）& 35（fig. E1, E2, E3）. ^ Löhr, Aḫanjāti in Memphis, p. 139-187. ^ Petrie, Memphis I, Ch. VI, § 38, p. 12; plates 30 & 31. ^ Sagrillo, Mummy of Shoshenq I Re-discovered?, p. 95-103. ^ Petrie, Memphis I, § 38, p. 13. 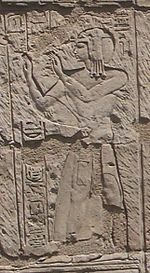 ^ Maystre, The High Priests of Ptah of Memphis, Ch. XVI, § 166, p. 357. ^ Meeks, Hommage à Serge Sauneron I, p. 221-259. ^ Joanne & Isambert, Itinéraire descriptif, historique et archéologique de l'Orient, p. 1009. ^ Maspero, Histoire ancienne des peuples de l'Orient, Ch. I, § Origine des Égyptiens. ^ Herodotus, The Histories（Vol II）, § 99. ^ Anthes, Mit Rahineh, p. 66. ^ 41.0 41.1 Mahmud, A new temple for Hathor at Memphis. ^ Brugsch, Collection of Egyptian monuments, p. 6 and plate IV, 1. ^ Brugsch, Collection of Egyptian monuments, p. 8 and plate IV, 5. ^ Grandet, Le papyrus Harris I, § 47,6 p. 287. ^ Jones, The temple of Apis in Memphis, p. 145-147. ^ Lalouette, Textes sacrés et textes profanes de l'Ancienne Égypte（Vol II）, p. 175-177. ^ Herodotus, The Histories（Vol II）, § 112. 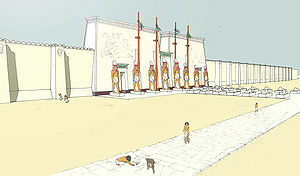 ^ Petrie, The Palace of Apries (Memphis II), § II, p. 5-7 & plates III to IX. ^ Jeffreys, D.G. ; Smith, H.S (1988). 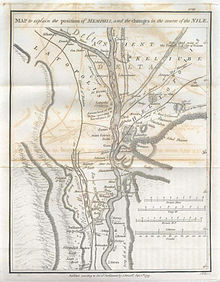 The eastward shift of the Nile's course through history at Memphis, p. 58-59. ^ Herodotus, The Histories（Vol II）, paragraphs 99, 101, 108, 110, 112, 121, 136, 153 and 176. ^ Strabo, Geographica, Book XVII, chapters 31 and 32. ^ Suetonius, The Twelve Caesars, Part XI: Life of Titus. ^ Ammianus Marcellinus, Roman History, Book XXII, § XIV. ^ Thévenot, Relation d’un voyage fait au Levant, Book II, Ch. IV, p. 403; and Ch. VI, p. 429. ^ Champollion-Figeac, l'Égypte Ancienne, p. 63. ^ Lepsius, Denkmäler aus Aegypten und Aethiopien, booklets of 14 February, 19 February, 19 March and 18 May 1843, p. 202-204; and plates 9 and 10. ^ Mariette, Monuments divers collected in Egypt and in Nubia. ^ Petrie, Memphis I and Memphis II. ^ Badawy, Grab des Kronprinzen Scheschonk, Sohnes Osorkon's II, und Hohenpriesters von Memphis, p. 153-177. ^ El-Hitta, Excavations at Memphis of Kom el-Fakhri. ^ Anthes, works from 1956, 1957 and 1959. ^ Jones, The temple of Apis in Memphis. ^ Málek, A Temple with a Noble Pylon, 1988. ^ Jeffreys, The survey of Memphis, 1985.